Earth’s biological resources and their diversity are vital to the well-being of humanity and economic and social development everywhere. Yet, biodiversity is being lost across the planet at alarming rates. Recognising the critical importance of biodiversity, a set of targets – the Aichi Biodiversity Targets – were agreed at the tenth conference of the parties (COP 10) of the Convention on Biological Diversity (CBD). These targets aim to halt the loss of biodiversity to ensure that by 2020 ecosystems are resilient and continue to provide essential services, thereby securing the planet’s variety of life, and contributing to human well-being and poverty eradication. Both public funding in the form of ODA and innovative finance mechanisms such as tax reforms and eliminating harmful subsidies, payment for ecosystem services, biodiversity offsets and green markets have been put forward as part of the strategy to increase resources for implementing the Aichi Targets. However, at COP10 in 2010 – in the very last hours of the meeting – for the first time in the history of CBD a whole decision was deleted. Parties could not reach agreement on the issues around innovative financial mechanisms and the decision had to be dropped to enable agreement on the other decisions. Parties considered that the institutional frameworks, regulations of markets and safeguards were not developed enough; while on the other hand a lack of trust and an absence of dialogue between actors with different political views prevailed. An agreement was made in these last hours of COP10 by SwedBio that offered to initiate a dialogue seminar as a possible way to move out of the deadlock and Norad offered to deliver a science-based background report to the meeting. A dialogue seminar was then held in Quito, Ecuador, in March 2012, convened by the governments of Sweden, Ecuador, Norway, India and Japan, together with the CBD Secretariat, and organised by SwedBio with the help of IUCN-Sur. Its objective was not to draft formal recommendations but to explore and contribute to the understanding of convergence and divergence of views in scaling up the mobilization of financial resources, and to prepare for the up-coming negotiations at COP 11 in Hyderabad, India. Nominated via the CBD Secretariat from Parties and Non-parties, the seminar included 80 participants ranging from governmental negotiators to members of civil society organizations, academia, indigenous peoples, business and intergovernmental institutions. The agenda included keynote presentations and small group discussions, which gave space for in-depth discussions. An informal and pleasant environment supported the intentions of the workshop by mixing presentations with opportunities for discussions in smaller groups. There was time for participants to get to know each other and to meet in more casual settings; for example, a long bus ride during a fieldtrip allowed plenty of time for in-depth, bi-lateral discussions. As a result of better dialogue and mutual trust, several areas of convergence emerged including the need for country-specific financing mechanisms and policies, safeguards and appropriate governance structures to avoid unintended outcomes. Fiscal reforms, particularly green tax reforms and removal of perverse subsidies, were considered promising, as were green markets. A regional follow up to the Quito I Seminar was conducted in Bolivia and South America in 2012. The report from this seminar became an Information document for COP11. The meeting became an official information document to the CBD negotiations, and the outcomes were presented from the podium during at the start of the next negotiation meeting in order to set a good atmosphere in the meeting. Furthermore, the Quito dialogue was referred to in the negotiation texts and, at COP 11 several negotiators said that the most important feature of it, apart from the rich understanding of opportunities and challenges posed by different financial mechanisms, was the convivial atmosphere and the renewed trust in the negotiations. Following the success of the 2012 Quito dialogue, SwedBio was asked to co-organise a second dialogue, as part of the preparations for the 12th Conference of the parties to the Convention on Biological Diversity (COP12). 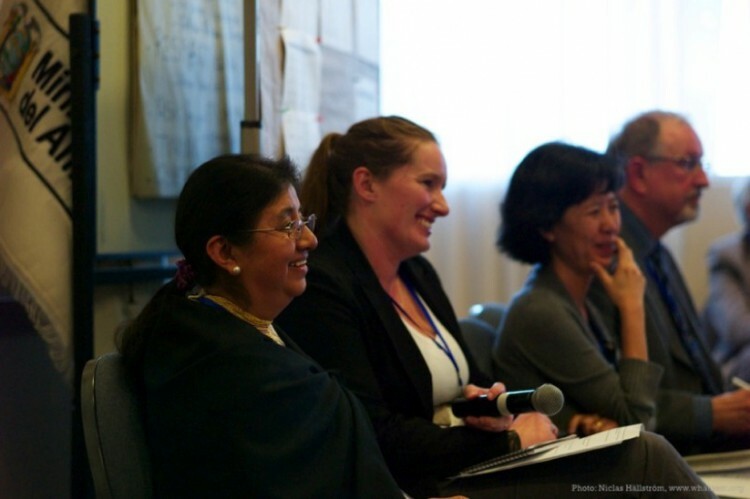 The Quito II Dialogue, “Scaling up biodiversity finance – with a focus on the value of biodiversity for policy choices, mainstreaming and funding” was held in April 2014. Once again the host was IUCN-Sur in Quito. The governments of Ecuador, India, Japan, Republic of Korea, Norway, Sweden, Uganda, the European Commission and the Secretariat of the Convention on Biological Diversity (CBD) convened the meeting. Nearly 90 participants attended the dialogue and included the same range and diversity of representatives as for Quito I. The seminar had similar aims as Quito I but there was a stronger focus on safeguards and also values of biodiversity. The seminar covered Mainstreaming biodiversity; Overview of financing mechanisms; Governance, safeguards and equity; Incentives and options for financing such as Payment for Ecosystem Services (PES), compensation schemes, subsidies, and Biodiversity Offsets; private and financial sector; fiscal reforms and international levies; and synergies for biodiversity financing, in terms of climate change, Sustainable Development Goals, and Overseas Development Assistance. It was acknowledged that valuation of biodiversity can be done using a number of methods, from dialogues with relevant actors who communicate and demonstrate qualitative values – to valuation in quantitative and economic terms. It was also discussed that the term ‘innovative finance mechanisms’ (IFMs) is misleading since very few of the mechanisms are in fact innovative. Other terms were suggested, such as biodiversity finance mechanisms (BFMs) or environment policy/economic instruments. The importance of safeguards for any mechanism was discussed, partly elaborating on the safeguards paper that resulted from needs expressed in the first Quito meeting and later negotiations under CBD. The co-chairs’ report was available on the Internet, both on the CBD website and on the SRC website and available in both Spanish and English. Once again, it became an official information document to the CBD negotiations. Side-events at the negotiation meetings were arranged, and the Quito II dialogue was referred to in the negotiation text. Furthermore, voluntary guidelines for safeguards were adopted, based on a report developed by SwedBio/SRC that resulted from the Quito processes. ”Safeguards in Biodiversity Financing Mechanisms (BFMs) – measures for maximising the protection of biodiversity and people’s livelihoods, including local communities and indigenous peoples – can contribute to mainstream biodiversity and equitable governance across international and national institutions.” said Claudia Ituarte-Lima from Stockholm Resilience Centre and one of the authors of the report. In addition, a work related to the value and assessment of the collective action of indigenous peoples and local communities was initiated through the Quito processes. Dr. Braulio Dias, the Executive Secretary of CBD, concluded the Quito II seminar by saying that the two Quito seminars brought to light a wealth of ideas. He said that we need to go beyond decisions to implementation, and that it is important to understand what mechanisms and measures could facilitate governments in their implementation, and concluded that future CBD meetings would be arranged to include dialogues between negotiators to facilitate effective outcomes. Appropriate safeguards, institutional frameworks and compliance mechanisms are critical for all financing mechanisms for biodiversity. Payment for Ecosystem Services can be designed as market-based instruments or subsidy-like government payments depending on cultural-political orientation. Biodiversity offsets or ecological compensation can be regarded as either markets or compliance schemes, depending on their specific design. It is important to use clear terminology around markets and compensation to avoid unnecessary conflicts and understand where there are real divergences. For example, the word ‘compensation’ is in some contexts used for PES and in some contexts used for offsets; depending on language and country context. The importance of ODA was recognized. Public-private partnerships (PPPs) play a role; public funds can provide seed money for private investments. Green markets were considered promising – for example, between 2000 and 2010 the global market for certified organic farming grew from US$ 18 billion to US$ 59 billion. The importance of the private sector was recognised: as an agent of change and a source of tax revenue; it needs clear, long term incentives and regulations; there’s a need to incentivise more biodiversity-friendly business conduct, as well as tackling corporate behaviour that has negative impacts on biodiversity more effectively; and making clear distinctions between different kinds of private sector actors. Fiscal reforms, particularly green incentives and taxes – income taxes and new forms such as financial transaction taxes and air ticket levies, as well as curbing tax evasion – and removal of perverse subsidies, were considered promising. There are different views, concerns, risks, opposition and hopes related to financialisation of biodiversity through trading derivatives and green/forest bonds. Mainstreaming of biodiversity is needed in productive sectors and national budgets and strategies. Better coherence between different policy areas is needed, in cases where the inclusion of finance ministries is considered particularly important. Country specific mechanisms/solutions/innovations have to be developed according to different countries’ needs and their cultural, social and political contexts.